Imagine completing years of intense training—learning new languages, reading thousands of pages, dedicating countless hours to research, writing lengthy papers. Then, at the end of your training, when it’s finally time to celebrate your accomplishments, you can’t! That’s exactly what happened to Alex Arias from El Salvador. 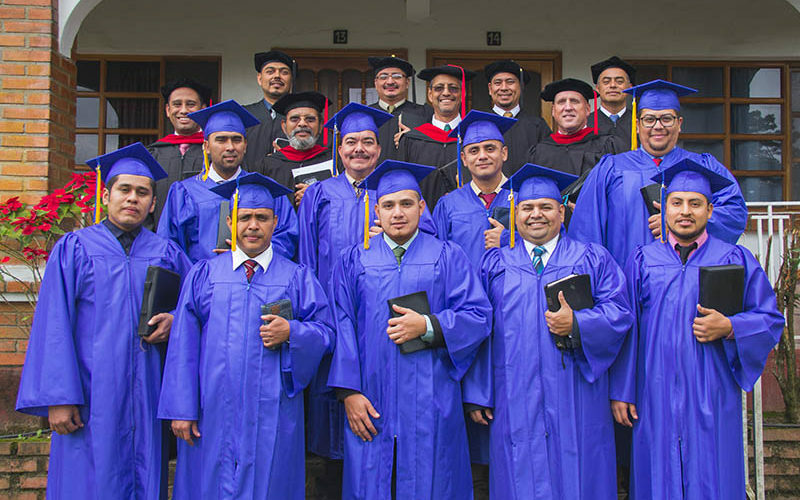 He traveled from his home to take modular courses at the Seminary for Expository Preaching at MEDA, The Master’s Academy International’s member school in Honduras. Over the time of his training, the Lord graciously helped him overcome challenges that included adjusting to rigorous academic requirements, getting married in his second year, having a baby in his third year, financial strain, and the challenges of traveling for training. Alex excelled in his studies and completed seminary training. As graduation approached, his excitement grew and plans were made for his wife, two children, parents, four brothers, two sisters-in-law, and his pastor to travel to Honduras for graduation. Sadly, though, political upheaval in Honduras made traveling dangerous, and MEDA’s December 2nd graduation ceremony had to be cancelled. He and his family had to cancel travel plans, lost their $200 car-rental deposit (two weeks of wages for the average worker in Central America), and though the ceremony was rescheduled for just over a month later, the family could not afford the trip. Instead, Alex made the 13-hour bus trip on his own. Alex, along with eight other graduates, celebrated their accomplishments and immediately returned to the work of the ministry. Robb Kensinger, who teaches at MEDA, said, “Alex never complained once.” Alex, along with eight other graduates, celebrated their accomplishments and immediately returned to the work of the ministry. One student from Nicaragua could not attend because of the postponed graduation. Robb went on to say, “We are so happy for these men and all they accomplished in their training.” He added, “In reality, this is only the beginning for them as they take what they have learned on into ministry.” That’s clearly true in Alex’s case, as he has begun serving at Iglesia Bíblica Bautista (Bible Baptist Church) in El Salvador, where he leads discipleship and evangelism ministries under the guidance of his senior pastor. Though the circumstances of a fallen world kept Alex’s graduation from being what he expected or hoped, he rejoices in serving the King of Kings. Join us in rejoicing for Alex, the other nine MEDA graduates, the completion of their training, and new workers now equipped and sent into fields white with harvest. Also, continue to pray for the professors and current students at MEDA, as they continue to serve the Lord faithfully, regardless of the circumstances surround them.